The Rutabaga is the first boat I purchased and fixed up, and as such is a place I adore and call home. I bought it in December 2013 in rough condition and later came to find out it was barely floating. With a lot of help, I spent 6 months rebuilding it top to bottom. It was originally constructed in the 80s during a boom time for houseboats in Seattle, giving it the lines of its original "house barge" design, plus the 2nd story which was added on the bedroom. Now, its a funky, interesting place with lovely views of the city of Seattle and Lake Union. This house barge is a darling little place with all you will need - no amenity lost. Full kitchen, living space with sofa and table, bathroom with hot shower and functioning toilet, 3 wall heaters for cozy nights, 1 full size bed perfect for two, and a beautiful rooftop deck boasting enviable views of downtown Seattle and Lake Union. -You will also receive full check-in instructions and the house manual before your arrival. I also love to sail and have a great pup named Bebop. 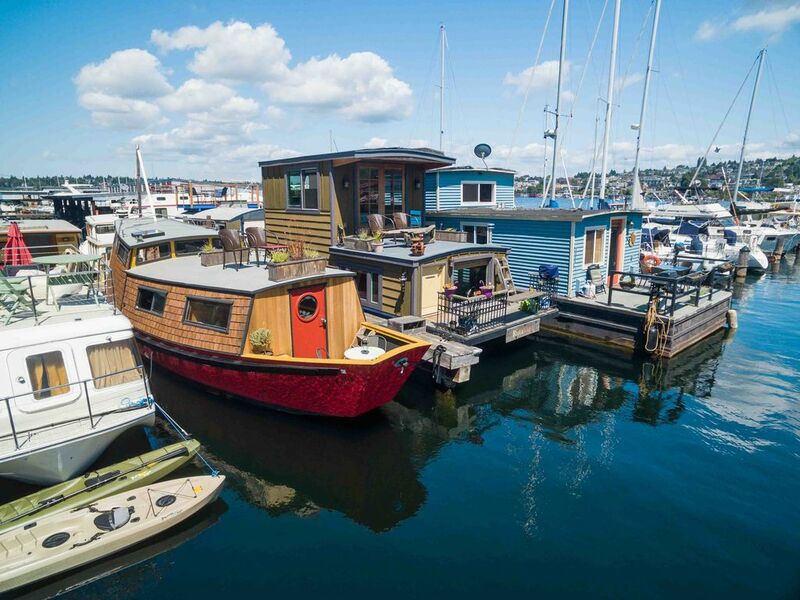 Houseboat sits on Lake Union and has stunning views of the lake and downtown Seattle. We absolutely loved our stay at the Rutabaga House Boat on Lake Union! Finding the parking lot was easy and there were ample spaces available. Please make sure you leave NOTHING of value in your car. We heard of a nearby car in the same lot that had their window broken by thieves. Fortunately our car was fine during our stay. I will say that getting "in" to the boat was a bit of a challenge. The lockbox was right where they said it would be and it opened up the marina gate just fine. The problem was actually opening the door on the boat. According to arrival instructions, one of the keys in the lockbox unlocked the door on the boat (the other unlocked the marina gate). This apparently was not the case as we stood outside trying to unlock the houseboat door for several minutes. Neither key would work at all. We were about to call the property manager when we noticed the houseboat door had an electronic keypad lock. Just guessing, we tried entering the same code that unlocked the keybox outside the marina gate. Success! Not a big deal, but I'd recommend the manager update the arrival instructions. Once inside, we fell in love with the place. A bit cramped getting in and out, but we sort of expected that staying on a houseboat. The bathroom and shower were great. The kitchen was a perfect size and it was great having a couple of outdoor decks to sit out and take in the sun and sights. The upstairs bedroom was roomy and very comfortable. WiFi was available and worked just fine. A couple of nice restaurants were within easy walking distance (at least for us). China Garden Restaurant was about half a mile north and Duke's Seafood was about a mile walk south. Can't recommend Duke's enough! There are also a couple of kayaks available on the dock first come, first served. We had a blast going out kayaking one afternoon. Very cute, very cozy houseboat! Nice to be away from the office buildings a bit and have the kayaks for a little touring. The two decks available for outdoor seating are great! Parking, access, lockbox and marina toilets made this stay very easy. Great first time experience of houseboat living! Loved the Rutabaga. Roomy place & so full of character. Shower was great and bathroom was fine - so was marina bathroom. Bed upstairs was comfortable & loved the fresh air and windows. Would love to return someday! This was such a fun way to spend a couple nights in Seattle. The boat is super cute, and it was great to sit out on the deck and watch boats and float planes go by. I know some people complained about the toilets and parking, but it wasn't an issue for us. I was able to use the parking app and had the option of 2 hour parking right near the boat, or all-day, just a block down. We even used the Lime Bike app to pickup rental bikes and just ride around the lake and then to the space needle. Much easier than using our car in the city. Thanks for a great experience, we have already provided recommendations to friends that may be coming to Seattle. What a fun, unique way to stay in Seattle! We loved the quaint houseboat. Grew up in seattle and back for a Nieces graduation so thought what better way to enjoy it! Our 2 children, ages 9 and 11 thought it was the coolest. I would say that this would not be for the elderly as there are stairs/ladders which might be difficult for someone who is not as mobile. The local contact never got back to me when I requested an early check-in. It is requested to use the boat facilities at a minimum, and to use the marina facilities when we could, but neither of the keys provided worked for the marina facilities. There was only one dish towel, no napkins or paper towels which made it difficult. There were also not enough blankets and sheets for both the couch and air mattress for our children to sleep on. With these few changes - it would be even better. Nothing said “glamping” till reading the rule book. Too many rules. Too many, “if this doesn’t work, then...” and things didn’t work. We never figured out how to make them work, like running water... Too many rules about limiting power use, and how to clean to leave the place, like we weren’t there, or there would be extra charges. Overall, Not Great.